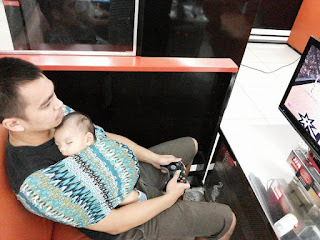 I was often told not to spoil my son by carrying him all the time. I don’t get it and I probably never will. My husband and I found our first carrier when we visited Legaspi Sunday Market in Makati when I was still pregnant. I told him we should get one when the baby comes out. 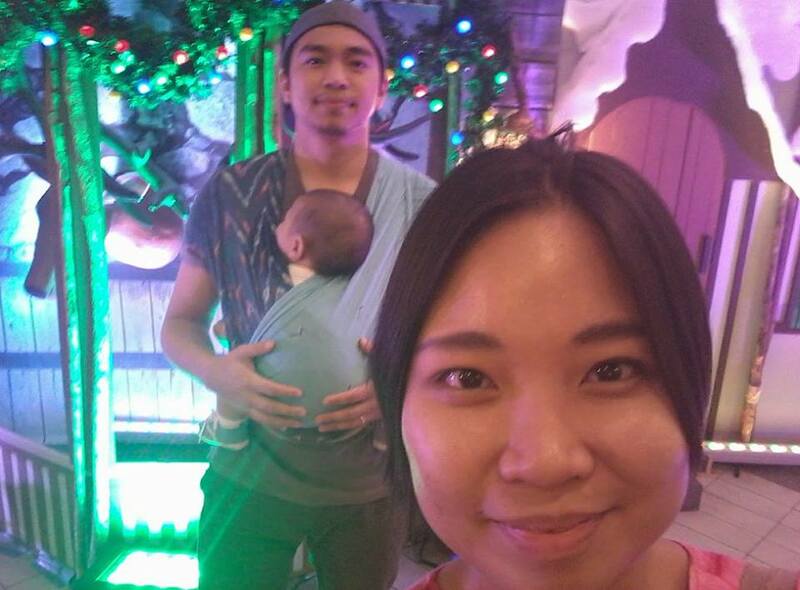 We also have a stroller with a full recliner that we got as a gift and it proved useful to carry our baby when he didn’t know how to stand yet. Now that he can stand on his own, it’s just scary because he’s a bit Houdini and can escape the seatbelt. We still use it to stroll a bit on the roof deck. So we have a stroller, why not use it? Isn’t that more convenient? 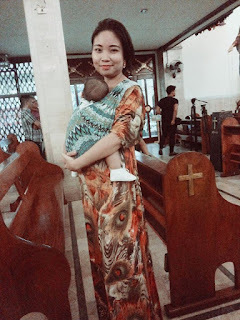 See, I am a stay-at-home mum with no helper who dabbles on breastfeeding peer counseling, studying for certification as a breastfeeding consultant and blogging when the baby is sleeping and I am without chores. We live on the sixth floor of a walk-up building. Yes, you read that right: WALK-UP. It’s actually the top floor (can’t say penthouse because it sounds mayaman, haha!) and we have lived here a few weeks before we got married, so another yes on I used to go up and down our building during my entire pregnancy (and no, that didn’t help me get a normal spontaneous delivery). 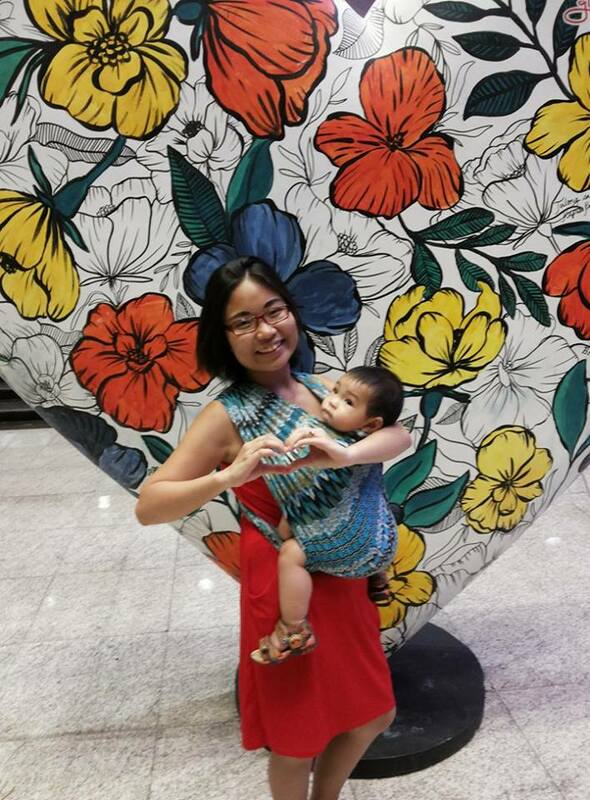 I cannot, by the life of me, bring the stroller up and down the building on my own while carrying a, now, 9-kg baby. My SaYa is a lifesaver. We got my SSK Maharlika when Khale was a month old and then got my husband’s SSK Inca Coordinates when baby was four months old. We buy groceries twice a month, and I insist on coming because I love shopping for stocks (and I’m always dying to go out for sanity’s sake). 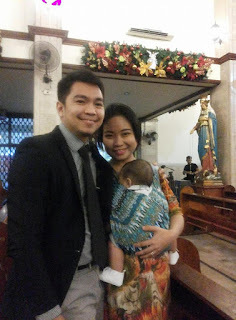 So far, I have washed our laundry, swept and mopped, folded linens and clothes, ran errands, went to church, attended a wedding and more recently, paid my dad’s PhilHealth contribution. I usually walk for errands. Everything seem to be walking distance to me, so it’s not some easy feat when I do errands. 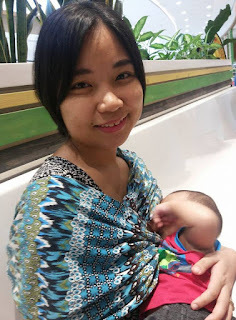 Babywearing helped me carry a very clingy baby while my hands were busy with chores and/or work. I would love to post a picture of us doing the laundry, but it’s a chore that I do when my husband’s at work and no one’s with us to take a candid shot. 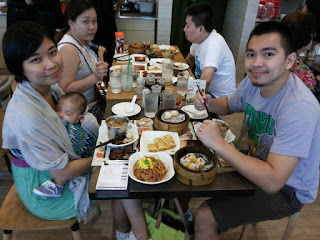 This was one of our lunch dates and I was able to eat while Khale slept comfortably. So going back to SaYa, it’s a locally-made hybrid wrap made up of two loops that are linked together, and it has three kinds: SSK, VTB and Marble. The one we have is an SSK (semi-stretch knit). The fabric is a blend of 95% cotton and 5% spandex, which in my opinion is best for our country’s climate as there’s less heat factor when using it. VTB (versa tekk blend) is 80% nylon and 20% spandex, so it’s stretchier and works best for cooler climates or air-conditioned places. Marble is a hybrid. It has one SSK loop and one VTB loop. That’s the best of both worlds. Sizing depends on the wearer’s fitted t-shirt size and not the baby’s. 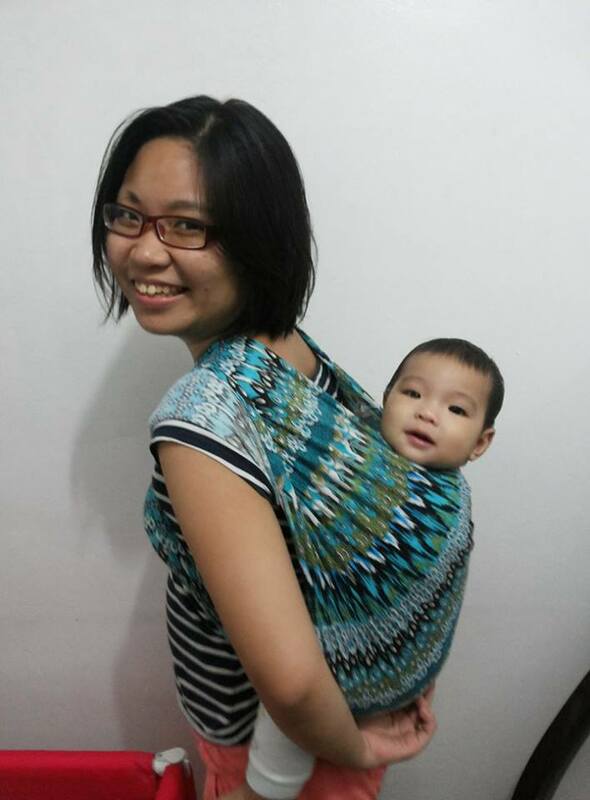 As with other (ergonomic and recommended) carriers, baby should be kiss height when worn. It may be a bit tight and may seem like baby’s not happy on the first try, but after getting the hang of wearing it, it’ll be a breeze to make the baby fall asleep in it. I’m able to wear my son without any help. I don’t normally cover up when breastfeeding, but I’ve used it a couple of times to nurse. Duyan. He was a month old here. Lakbay. I need assistance here, so I might not use this position often. My husband and I love our SaYas. While others are dreaming for soft structured carriers when their budget permits, we’d probably buy more SaYa in different designs if we had more money. 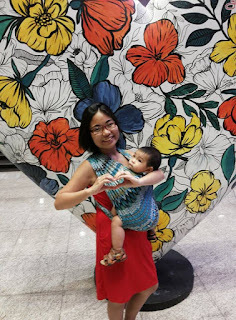 Recently, on my birthday trip to Legaspi Sunday Market, we met a fellow babywearing mum who made a quick chit chat with us. She was using a non-ergonomic carrier. She asked about my SaYa and said my son seemed really comfy in it. 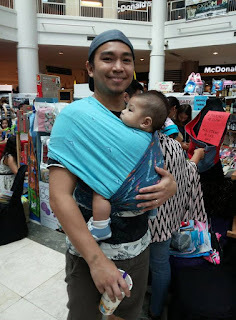 Being the jolly, extremely friendly person that I am, I was able to discuss ergonomic and recommended carriers, where to get SaYa and to join Babywearing Philippines. 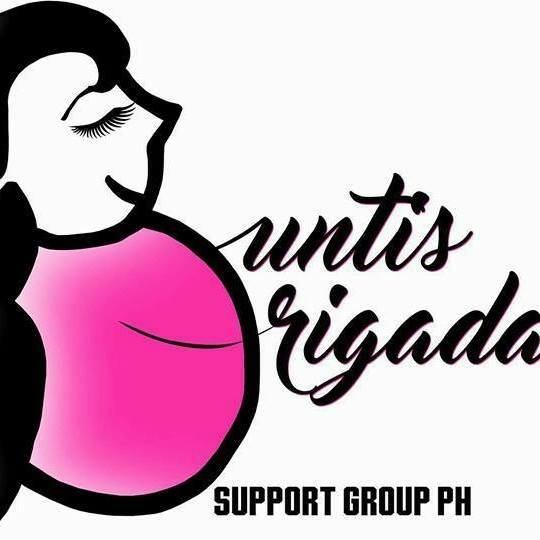 For more information on proper babywearing, and ergonomic, recommended and safety-tested baby carriers, please join us in Facebook at Babywearing Philippines. Would like to know more about MUM, please. I also breastfeed, babywear, co sleep and semi-cloth diaper my baby. Read your profile, Ihihi, and I left my PR work too last year when I was four months pregnant. 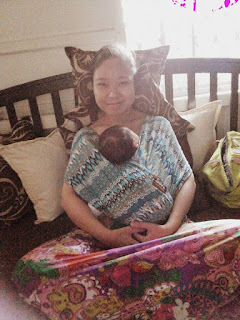 Now, I'm a full time mom and would like to know more about breastfeeding. 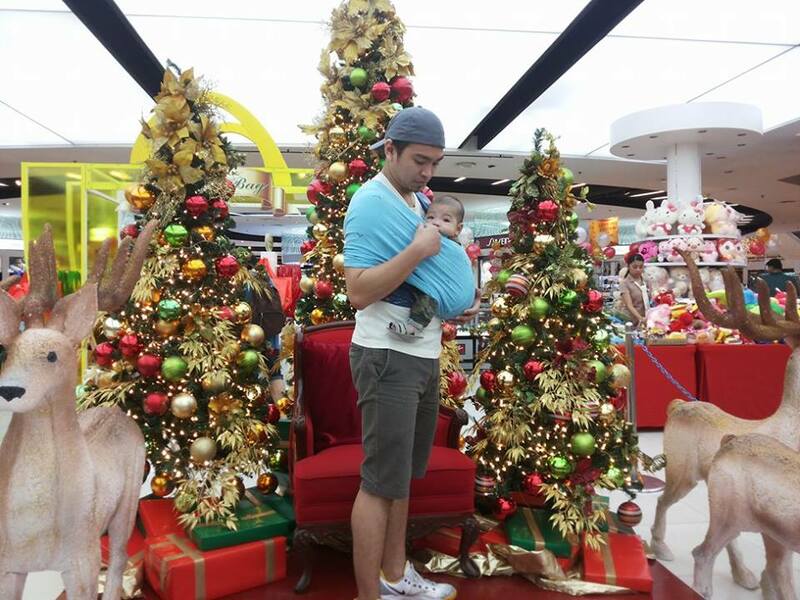 I would want to breastfeed my baby until he wants to. Hello fellow attachment parenting practitioner! :) should you encounter any problem with breastfeeding, sabihin mo lang. I'm just around. Happy breastfeeding! And so many designs. I honestly want more. So I can match with outfits. Lol. I haven't tried using this, I wanted to, but I was afraid for the knots to get loose. 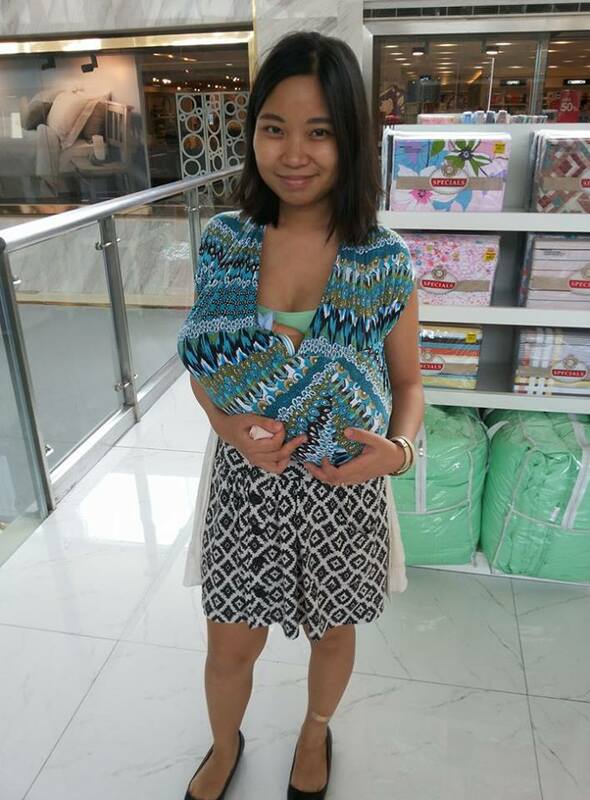 =) I honestly stopped using any baby wearing, it was a little difficult, but this one could have helped me, especially when out shopping. We were a babywearing family! I think we only used a hand me down stroller once! 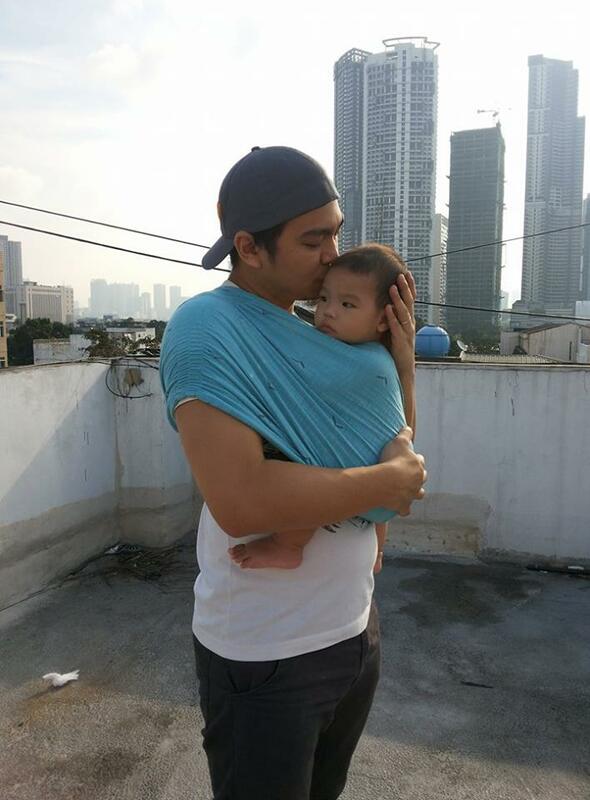 We bought a SaYa carrier too. Babywearing is so liberating! You can do a lot while wearing your baby. Super close niyo pa lagi ni baby! I miss those days! 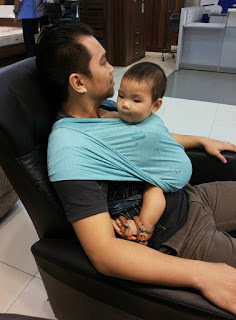 For all our 3 kids, my husband was the one who used a sling. I wasn't comfortable with it. It must be so convenient to babywear. I never got to try because it just wasn't being done back when my now teenage kids were babies.